Indian dinnerware ranges from beautiful, artistic pieces of hand-made pottery dinnerware crafted by Native Americans, to dishes from India or fine china dinnerware creations influenced by the cultures of Native Americans or the people of India. All of these choices feature stunning dishes that make good dinnerware selections. I was raised in northern New Mexico in a little town that sat central to the land of the Navajo Nation. I remember, even when was a little girl, being amazed by the talent and creativity of the Navajo artisans who created hand-made, artistic pieces of pottery, jewelry, woven items, and sand paintings. From hand-crafted jewelry to woven rugs, to pottery pieces and sand paintings, the culture and creativity of the Navajo People amazed me. When I first thought of Indian dishes, this Southwest style of pottery immediately came to mind. Personally, I think it is beautiful. Where I live now, you don't see so much of it, and I truly miss shopping the flea markets where talented Navajo artisans frequently displayed their arts. When looking into choices of Indian dishes, I realized that visitors might be interested in dinnerware from India, or dinnerware that features the customs and designs of that country, truly revealing my limited scope. What I found when looking for Indian dinnerware included dishes ranging from copper to fine china, to hand-made pottery and southwestern designs. The choices are really unlimited and the variety of styles are very unique. When it comes to Indian dishes, there is much more available than the Southwestern Pottery that I was familiar with. 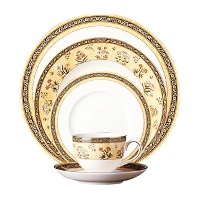 Wedgwood offers an India pattern that is made of bone china that is simply gorgeous. It has borders of saffron and dark blue with floral and scroll motifs with a 22 karat gold band. That is way different than my original vision of Indian dinnerware, but it is a stunning choice as well. Whatever your vision of dinnerware is when it comes to Indian dishes, I hope this helps you to find exactly what you are looking for. All of these dishes are amazing at adding to the chosen décor and making your kitchen or dinner table look fabulous.